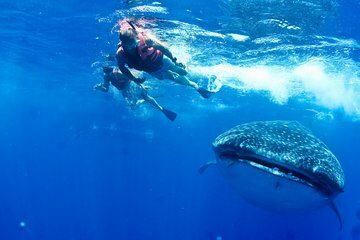 Enjoy an unforgettable swim with whale sharks during this serene, all-inclusive adventure, with private hotel pickup in Playa del Carmen. Hop a boat to head out on the open waters, while you keep an eye out for turtles, dolphins, and manta rays. Whale shark sightings are guaranteed, so get ready to snorkel alongside the peaceful sea creatures. All levels are welcome, and drinks and breakfast are included.